As a registered charity our main aim is the education of the public. Our Centre is open Wednesday to Sunday 11am to 4pm all year round, entrance fee. Due to the size of our premises, we can only accommodate groups of 12-15 at a time, but larger groups can be split into two and one group taken on a tour of the harbor and old town or art gallery whilst the others are in the Centre. Our volunteers are always happy to visit your group and deliver a presentation about Scarborough's amazing maritime history. For schools, we have a treasure chest of maritime objects that can be loaned out to primary schools for educational purposes for use with children age 4 to 8. The treasure chest is in the shape of a wooden fish box and contains a scale model trawler net, fishermen and women's clothing, a model coble boat and a trawler, a model fish, life-belt, ship's wheel, compass and many historic photographs. A set of maritime word 'flashcards' and a simple word search game are included along with a teacher's guide book and CD. SMHC volunteers are available to come into your school, group, club or organization and deliver a talk on Scarborough's maritime history, call 01723 369361 or email scarboroughmaritime@yahoo.com (There is no set fee for this service but donations to help keep the Centre going are appreciated). If you are doing research into your family or local history, we have a well stocked library and archive with a research area where you can use a computer and desk. Please contact us for more information. CHILDREN'S UNIVERSITY - We are part of the CU network starting in 2016. 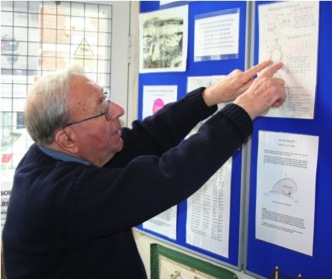 Volunteer & retired science teacher, John Barton, explains the principles of displacement (why heavy ships float) & how sails work.